.surf is a proposed TLD in ICANN's New gTLD Program. It is one of 68 applications that Top Level Domain Holdings Ltd. (TLDH) has filed for on its own behalf. The application succeeded and was delegated to the Root Zone on 18 June 2014. .Surf is a new generic top-level domain targeted to amateur and professional surfers, surf brands, and surf culture as well as for use in applications such as surf videos and surfing events. .surf was delegated to the Root Zone of the DNS on 18 June 2014, completing the successful application for the string. .Surf web addresses are connecting surfers across the globe. 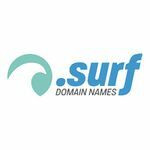 Whether you’re a rider building a site to showcase your videos or a surfing brand looking to connect with new customers, a .surf domain name shows your visitors that you’re part of surf culture. It’s a way of conveying your passion for the waves before they’ve even loaded your site. .Surf domains are also easy to remember, which increases your site’s visibility and builds brand awareness. On a web full of .coms and .nets, a .surf domain will stick out to any waverider who spots it. On 09 January 2014 TLDH received a Registry Agreement signed by ICANN for .surf after passing all the required processes needed to become a Registry Operator for the string. This page was last edited on 16 November 2017, at 23:16.